Rucksack Readers is an established publisher that specialises in long-distance walks around the world. The book on the Causeway Coast Way follows the same format as other titles which are rich in evocative imagery, educational with all the relevant background information and extremely practical with step-by-step directions to accompany the walker whilst on the trail. 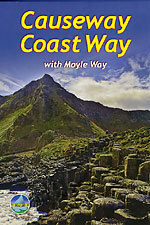 The book is follows the guide of several tour operators in the area that provide walks along the Moyle Way and the Causeway Coast Way back to back. In addition to three short walks described on Rathlin Island, the text covers enough ground for the foundations of a full-weeks holiday. As with other Rucksack Reader publications, the pages in the book are waterproof which makes it ideal for the weather conditions in Northern Ireland. The spiral binding also allows for it to be carried whilst walking and remaining open on the right page. The fold-out map at the back of the book covers the whole Causeway Coast Way at a scale of 1:85,000. The map of Rathlin Island is slightly more detailed at 1:60,000 and there are also two maps within the book, alongside the directions for the Moyle Way, which are also on a scale of 1:85,000.